A lot of people will give their advice when you start a new venture. When John started TalkToTheManager, he got the firehose of advice. It can be tough to deal with, especially when you're inexperienced and afraid of what is ahead. 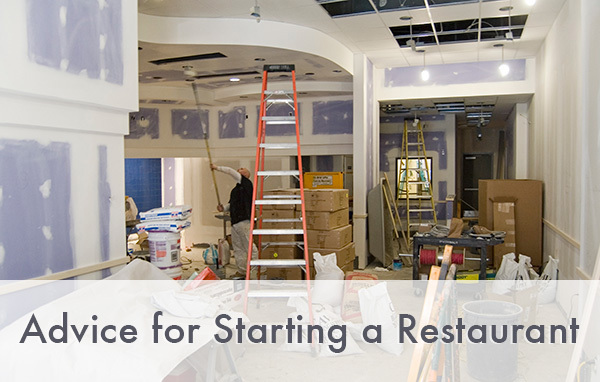 We've gathered quite a bit of advice for those looking to get started in the restaurant business. Disclaimer: These are not our words, but a variety of opinions we've gathered from those in the business. Some may be harsher than we would be. You're going to have a tough time, even tougher than you think. So get into it for the right reasons, or don't do it at all. The question you need is to ask yourself can you offer a cheap of a meal as possible for as much money as possible while paying the staff the least possible and working as much as possible. Can you go from having someone tell you that the food is terrible, to telling your staff to work harder without them leaving, to thanking someone and have a nice day all in the span of 5 minutes? Over and over? Hire well and listen to veteran restaurant owners, not veteran restaurant staff. Do you have restaurant experience? If not, and you're really looking to do whatever it takes, I'd tell you and your business partner to quit your day jobs and get full-time jobs working in restaurants, preferably in different areas, to get a full picture. What would your advice to me be if I said I'd like to sell my restaurant and open an IT firm or an accounting firm even though I've never worked in one and have no specialized education in it? I may pick it up quick, I'm pretty good with numbers, and not bad with computers, but you might still have some general advice for me. Whatever advice you're thinking you'd give me, might be worthwhile to take yourself. Do you have a chef already? Tell me you're not going to try to run the kitchen yourself, are you? Do you have a FOH manager or general manager? Do you have enough capital to pay for food, utilities, and payroll for six months or more? * a good chef who knows how to run a kitchen and plan menus (N.B., a chef is not the same thing as a good cook: a commercial kitchen is more like running a factory than hosting a dinner party) * FOH management who knows how to hire, train, and manage service staff, who knows how to control shrinkage and set schedules, and who knows to handle customers. * Enough capital to get you through the "tweaking" stage, until you reach profitability. This is going to sound crazy, but you could do worse than to watch 100 episodes of those "restaurant rescue" type shows. Don't staff with friends or family. Don't take money/investment from friends or family, either. I would suggest that you plan out on paper all of your ongoing costs (rent, payroll including yourselves, food, utilities, advertising, etc) and make sure you have at least 6 months worth of cash before you do this. There is nothing sadder than a new business running out of money just when it starts to get traction. If your FOH manager will be learning on the job, then double the seed cash from 6 months to a year. As for the chef, he/she has run a kitchen like this before, right? Managing inventory, planning menus, planning food costs and portion sizes, negotiations with vendors, setting schedules, etc? You need to be less worried about someone you can control, and more worried about someone who knows how to do this well and who can be up and running instantly. Every week of "learning curve" is more seed money that you are burning through. If your chef does not have several years experience being a bona fide chef in a similar restaurant, increase your seed money to two years. Two big things from my point of view are Marketing and Culture (they are somewhat related). Marketing will drive the menu selection. I think it is important to have a couple of dishes that look great on social media. There are some big wins there. Work out how you will hire and retain your staff. Making them feel part of something bigger than just their job makes a huge difference. Be prepared for really long hours, really deep and dark and scary times BUT be really excited - launching and running a restaurant can be hugely rewarding! Listen to restaurant podcasts to learn as much as you can. Eric Cacciatore at Restaurant Unstoppable has a great one. You can learn a lot from podcasts. Make a Facebook page as you are renovating and update with pictures along the way so that there will be anticipation before the opening. Install security cameras from day one. If they are there from the beginning your employees won't feel insulted when you install them later after discovering someone is stealing from you. They will. Have one or two soft openings with friends/family who are forgiving. Do not open on a weekend. Open on a Monday. Write a clear contract between you and your partner in the case one of you wants out in the future. This needs to be established early not after you hate each other. Get good managers. You can't focus on running and building a business when you are dealing with the day to day. You will burn out. Resolve yourself to focusing on big picture stuff and let great management handle the execution of details. Get in good with the local community, like events, fundraisers and the local Chambers of Commerce. Good and long-lasting restaurants always keep the community in mind. Make friends with other restaurant owners who are not in direct competition. They will be invaluable for leads on suppliers, hints and tips and even staff sharing. Ask them to mentor you if you can. Before you spend tons of money, make sure you're pretty sure you're going to make money. If you're not sure, try and do a pop-up restaurant (short term lease) or start with a food truck. This will also be a good test if you like hospitality or not. if you outgrow it, then invest in a brick and mortar. Of course, there is a lot more to it: passion, product to market fit, marketing, location, etc. Our service allows your customers to send you anonymous feedback by text message, but you can still text them back and resolve problems before the customer leaves. It's completely private. First month FREE. Then only $29 per month per location. With 10 years in the restaurant industry and 7 years as a cook/chef, I have a passion for helping restaurant owners succeed and create wonderful experiences for their guests. Food is love.